I’m a Texas boy and a guitar player who married a girl from Ireland, 34 years ago. I’ve always loved folk and traditional music and she quickly got me hooked on the wonderful music of her native land. I started out on the tin whistle, until I finally realized the pipes were calling me! The Irish uilleann pipes are very different from the Scottish Highland Pipes (a glorious instrument in its own right.) It is not much louder than a fiddle. 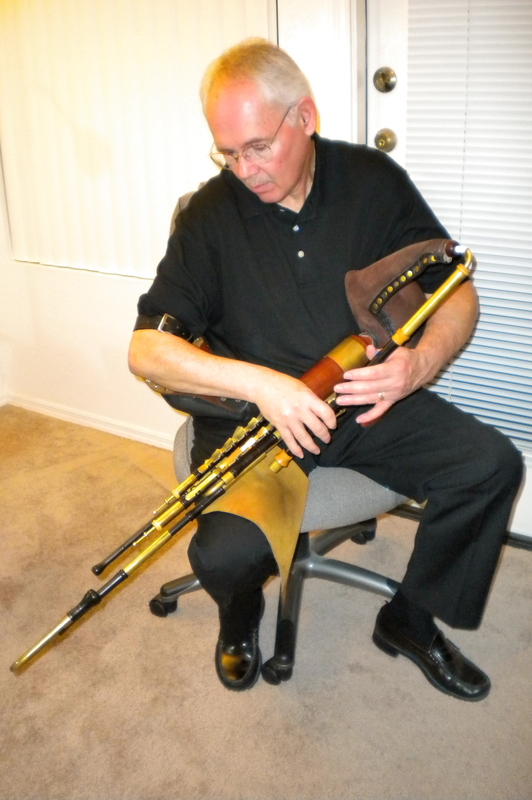 It differs from all the other bagpipes in that it can be stopped between notes. These instruments are rare and hand-crafted. I play a D-pitched ¾ set made by master pipemaker Kirk Lynch. The pipes are taught by ear. I have had personal instruction from Kirk Lynch, John May, Sean Og Potts, Gay McKeon, Mickey Dunne, Cillian Valley, Sean McKierney, Ivan Goff, and Paddy Keenan. I play at weddings and funerals and, along with my fellow Irish Traditional Music fanatics, I play regularly at the two Sunday Irish “seisiuns” (Tim Finnegan’s Pub, 1-4pm; Fibber Magee’s Pub, 4-7pm) and at the monthly Ceili dances at the Irish Cultural Center. I don’t have to say too much about the pipes – they either reach deep into your heart or maybe there’s a wall around it. The Pangean Orchestra is a wonderfully intriguing idea backed by a noble vision. I love getting together with musicians from different backgrounds and trying to come up with something we all had a part in. To hear the orchestra is marvelous, and it is also a powerful metaphor for world peace.